← How do we see up close? The focal, central or Parvocelluar visual system is called the “What” vision system. It is responsible for object identification. It allows us to focus on a specific object in the visual field. This information is interpreted in the occipital lobe. The ambient/peripheral or Magnocellular visual system is the “Where” system responsible for spatial information, balance, coordination and peripheral awareness. This information is shared with the occipital lobe, in addition to links to the cerebellum and balance areas of the brain. Functional MRI shows this information actually reaching 99% of the cortex. Using ambient vision, we can automatically change our posture and gait to walk uphill or protect ourselves from falling over as someone bumps into us. Functionally, these two systems allow use to look at the road ahead of us (focal vision) and be aware of the car to our left(ambient). It also allows us look at the TV but be aware of where the door in the room is. It allows us to be focused on a word in reading, but still make accurate saccades to the next word. Notice what happens to the people attempting to walk through the tunnel. Notice how the people in the tunnel are leaning to one side. The tunnel walls have confused their ambient vision system and affected the gait and balance. This is one eye, but the other may look the same. Notice the reduced periphery that might not show up in typical in-clinic screening of visual fields. 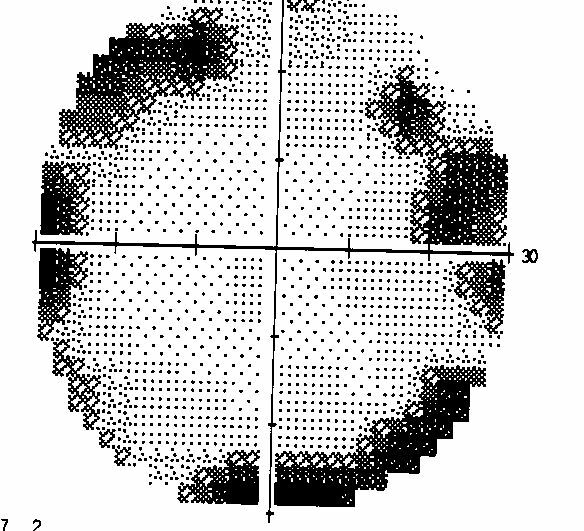 This visual field test is called a Goldman 30-2 and is done on each eye. It should be a standard part of the assessment of all of the post-TBI/CVA patients. To improve function of the ambient system, binasal occlusion may be added to a patients glasses with or without mild base in prisms. How does this help? A person that is over-centrally focused has a difficult time seeing the entire word. They tend to see letters rather than the whole word which greatly reduces reading fluency and comprehension. Saccades also become less accurate due to the decreased awareness of the line of text making the person lose their place frequently. This can also improve posture and gait. As the brain becomes more aware of the ambient visual system, it is better able to correctly adjust gait and posture. Remember the tunnel? Optometrists that offer this type of service are involved in neuro-optometry. The organization is called the Neuro-Optometric Rehabilitation Association. This is a multi-disciplinary organization that was started by ODs who wanted to understand brain injury better and exchange information with other providers of care in the TBI community like OTs and PTs. There is a provider list on their website to help you find a NORA optometrist in your area. This entry was posted in pediatric, Physical therapy, vision rehabilitation and tagged balance, brain injury, eye movements, field cut, Florida, gait disfunction, glasses, learning disabilities, neuro-optemetric rehabilitation association, neurological rehabilitation, occupational therapy, optometry, Pensacola, post trauma visoni syndrome, read problems, saccades, stroke, toe walking, vestibular problem, vision, vision rehabilitation, walking. Bookmark the permalink.